Next Samsung Gear VR leaked! On August 2, Samsung will announce the Note 7. 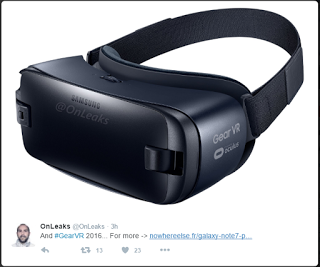 However, according to NowhereElse.fr, we may also see the next Samsung Gear VR. According to NWE, the next Gear VR will be compatible with the USB Type C used in the Note 7, but will also be retroactively compatible with the Note 5, S6 series and S7 series. The field of view will also increase from 96 degrees to 110 degrees. It will be available next month. There was no word on whether either the Note 7 or new Gear VR will be compatible with Google Daydream. However, I think the Gear VR will indeed be Daydream compatible: First, Daydream is set to launch this Fall, and Samsung is a Daydream partner. It is unlikely that Samsung will release two competing headsets within the same time frame. It is much more likely that Gear VR will be cross-compatible with Daydream. Second, if there is indeed a change in field of view as indicated by NWE, it could be an indication that the Gear VR was modified to make it Daydream-compatible. Check out NowhereElse’s post! Thanks to Mike Cane for bringing this to my attention! For more information on the Samsung Gear VR, see my review or this FAQ. Budget VR-Ready gaming PC for $600 or less with NVidia GTX 1060!